Here are some great pictures of Daniel Francken and Hannah Gibson. 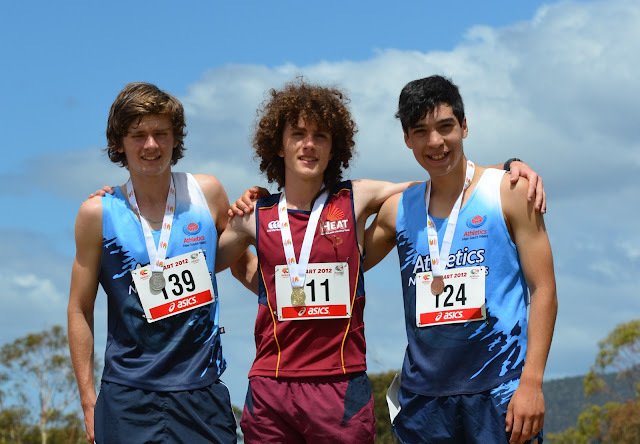 Daniel Francken, aged 15, was 3rd in the under 16 boys 3K with a time of 8:55. We are very proud of him! Hannah, aged 16, was 3rd in the 17-18 girls 2K steeplechase with a time of 6:53, and 6th in the 3K with 10:17 - and she makes it al look so effortless. Daniel is 3rd from left. What a nice setting for a running track. What style! Look at that stride length! Is that Hannah watching to the left, or a look alike? Hannah looking very happy with her steeplechase medal. Daniel on the right. This is what Nationals medals look like.